Beach: 1/10 mi. Englewood Beach & Seagull Beach 1 mi. 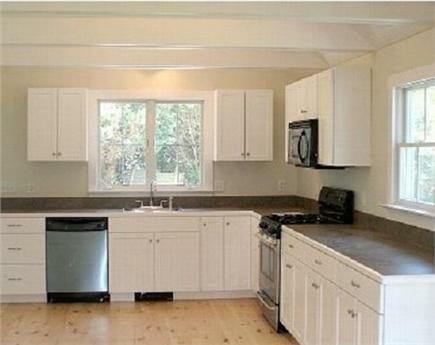 Beautifully re-built cottage with new stainless steel appliances and old fashioned wide pine floors. 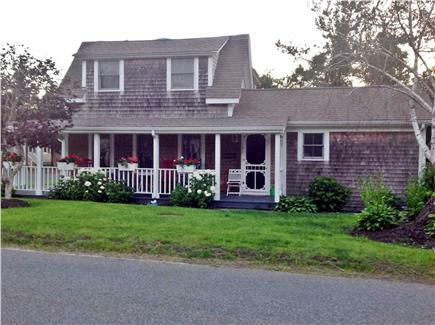 A fabulous property in the town of West Yarmouth. Your walk is less than one tenth of mile to the peaceful beach on Lewis Bay. Boat owners, bring it along. 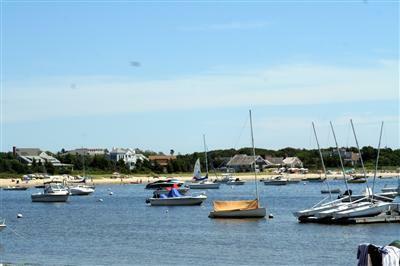 Lewis Bay offers a public boat launch, the same distance as the walk, allowing you to launch your boat, bring the trailer back, park on site and walk back to meet the family. This stunning two-story cottage offers plenty of windows, an open floor concept, cathedral ceilings, and is tastefully decorated throughout. 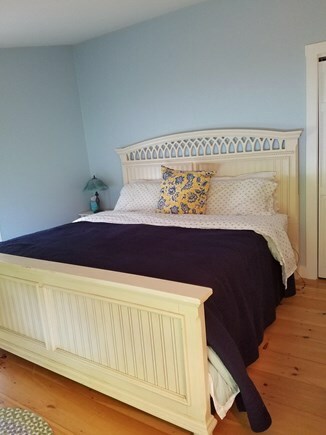 The main level has a kitchen, dining area, comfortable living room with fireplace, a full bath, laundry closet and master bedroom with a king size bed. 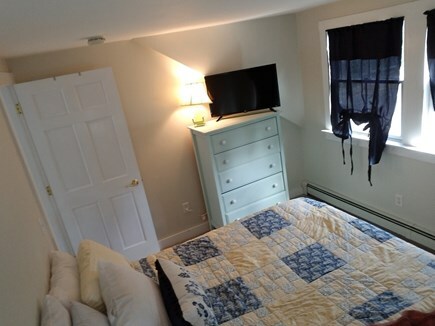 The second floor has two bedrooms, one with 2 queen beds and the other with one queen bed, plus a full bath. 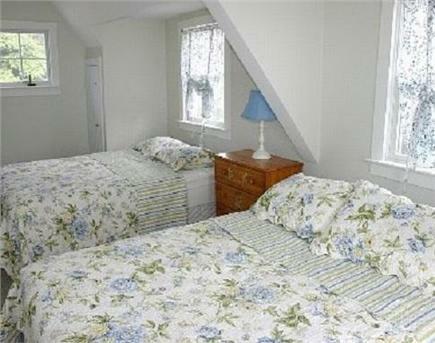 There is also a nice large wrap around farmers' porch and a deluxe outdoor shower. Great location, double lot, close to everything! Nearest beach: 1/10 mi. Englewood Beach & Seagull Beach 1 mi. Your home is beautiful! We have had a fabulous week and hope to come back again. We wish we could just move in and stay forever. 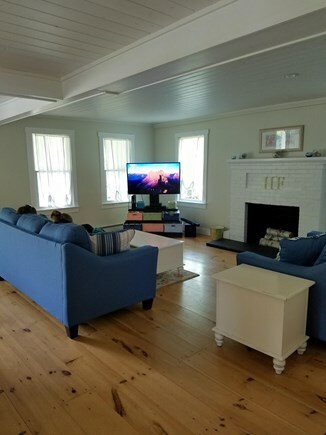 Thanks so much for sharing your home! My family and I loved this home! It was perfect and so relaxing. The house was very clean and the neighborhood was quiet which is alway a plus. Seagull beach was a blast and only a 10 minute bike ride down the road. 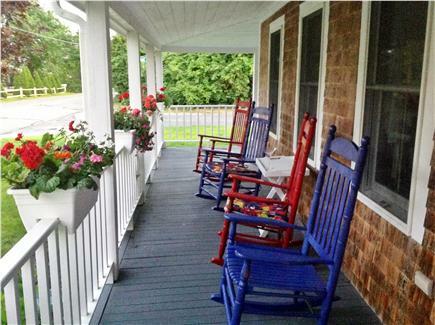 The porch was a great bonus as I enjoyed coffee and breakfast there each morning! The house had everything you could need and was accommodating to my large family. Definitely will stay here again in the future!!! 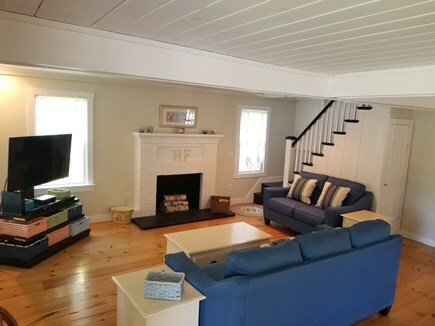 We thoroughly enjoyed our visit to the Cape Cod area and staying in this lovely home made it absolutely perfect! 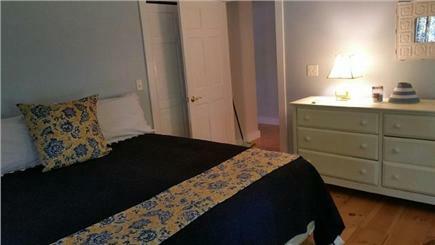 The house was clean, well maintained, nicely decorated and had everything we needed for a comfortable stay. I loved enjoying my coffee each morning while rocking on the porch and taking walks through the neighborhood and down to the beach. I would definitely recommend this home to my friends and family.